The club has been running two full dress colonial balls a year, but unfortunately low numbers mean we will not be running a ball at Maitland this year. and are even cheaper if you get in early! The Bush Music Club Inc. will hold its 2019 Heritage Ball in Goulburn on 25th May 2019. A grand occasion for your enjoyment with music by our renowned Heritage Ensemble. Dress in your favourite fashion from Colonial times and be ready to dance the night away. Ball tickets will again be limited. A light supper is provided, with refreshments available throughout the evening. As in previous years, the dance programme will include some old (and new) favourite dances and tune sets. 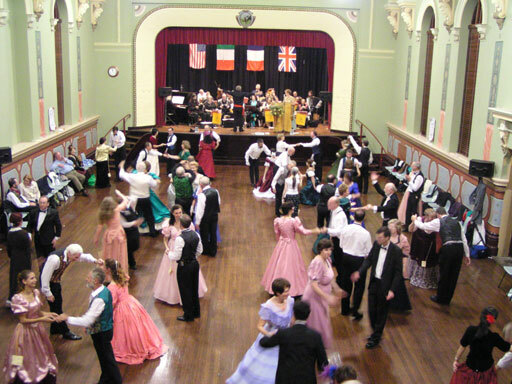 The Maitland Colonial Ball will not be held this year.